To help you survive the holiday season without gaining an ounce, here are some holiday eating fat habits and slim solutions to beat them. The eating season is officially here. And, while the idea that most Americans gain 5-10 pounds between Thanksgiving and New Year’s Day is false, the problem is, any weight gain during this time of year, will likely be with you for the rest of your adult life. Since preventing weight gain is easier than losing it; we’re all about helping you maintain your current weight during this willpower-busting time of year. We’re all about enjoying a holiday meal—albeit in a healthy way. Here are three of the most common “fat habits” we see this time of year and how you can avoid them. Fat Habit: Thanksgiving comes only once a year—how bad can it be to splurge for a day? All holidays are supposed to be just one day, but that’s not how we treat them diet-wise. 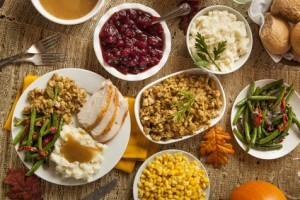 In most cases, Thanksgiving becomes Thursday-Sunday of overeating, drinking and getting less exercise than normal. In addition, once you’re back to business next week, all the holiday parties begin and food gifts start coming in, which means more opportunities to overindulge. It only takes a few extra bites of food each day to add up to a pound or more gained over six weeks. Every 3,500 extra calories is equal to a pound of fat. Since you’re reading this on Wednesday, eat about 3/4 of the normal size of all your meals and snacks. This will give you more leeway calorie-wise for Thanksgiving. On Thanksgiving day, start your day with an early exercise session. If you’re short on time, check out our 16-minute, at-home CrossFit style workouts. Have in your mind an eating strategy for the day. Know what you want to enjoy and stick to your plan. Avoiding or limiting alcohol to only one drink will help you stick with your resolve to stay on track. If you do overeating, consider 2-3 days of cutting back 1/4 of what you eat at each meal and snack to account for the extra turkey day calories. Fat Habit: I’m afraid if I don’t eat everything…I’ll offend our hosts. Trust us, no one is really offended if you say, “Thanks…but no thanks…” to seconds, desserts, cocktails or extra wine. This is a common excuse people use but it’s not based on any real facts. Taking half-sized portions is another way to show that you’re a great guest without overdoing it. Fat Habit: I’ll get back on track on Friday (..or Monday). That’s like saying; “I’ll start my diet on New Year’s Day, when I’m more motivated.” There’s no better time than now to make a positive change in your eating or exercise behaviors. Instead of putting it off, think: “If I can make it through Thanksgiving without overdoing it, I can eat right every day!” and Read it and live it: Never put off until tomorrow what you can do today.